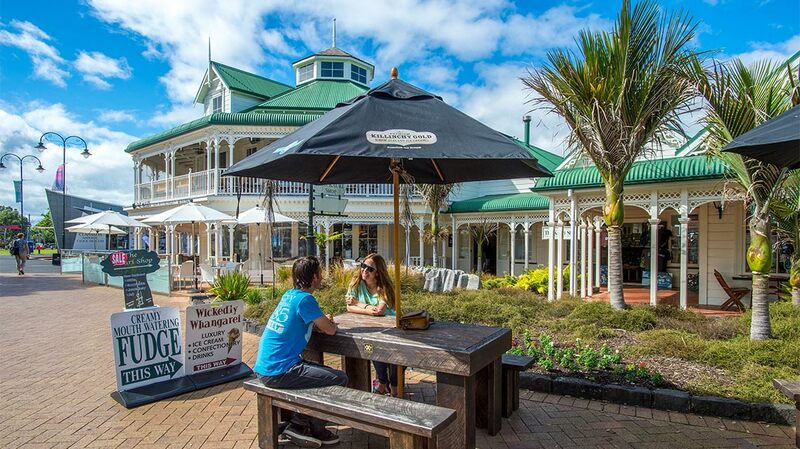 The Town Basin Whangarei is home to a picturesque international yachting marina with great restaurants, cafes and speciality shopping. At the Gallery ‘ Burning Issues’ you can view glass artists in action at their glassblowing workshop. The Town Basin loop walkway, art, culture and entertainment, history and heritage is all there for you to enjoy. Let the kids loose at the playground at the Town Basin and enjoy an ice cream or coffee while they use up some energy. Climbing, sliding, running or swinging. Enjoy the latest addition of Hundertwasser’s folly building “Te Kakano”. This is the colourful koru shaped building with a seating area. The folly allowed local craftspeople and builders to master the construction techniques necessary for the Hundertwasser Art Centre which commenced building in June 2018. Te Kakano – Friedensreich Hundertwasser’s folly building. The Hundertwasser Art Centre with Wairau Maori Art Gallery will be an iconic landmark. It is the last authentic Hundertwasser building in the world and will be located right in the heart of Whangarei’s beautiful waterfront. The building will be multi-faceted and multi-functional. It will include a state-of-the-art gallery of original Hundertwasser works and New Zealand’s first gallery dedicated to contemporary Māori fine art. We can’t wait to see this building completed! An Artisan Fair runs frequently through the summer months. Consequently adding to the vibrant atmosphere created by this gathering of artists, buskers and food stalls. The Hatea Loop Walkway – Huarahi o te Whai is a fully accessible 4.2 km walkway. It begins at the Town Basin Whangarei incorporating the Whangarei Town Basin Marina precinct, Sculpture and Heritage Trails. Sculptures are created by local artists, including the dramatic Waka and Wave stone sculpture at Hihiaua Point. A Maori waka (canoe) breaking through a towering wave, marks the entrance to the Whangarei Town Basin. Walk across the elegant footbridge, ‘Kotuitui Whitinga’ and the international award-winning ‘Te Matau a Pohe’ bascule opening bridge. Read the fascinating history of the area on the Heritage Panels. Most noteworthy are the legends of how Whangarei got its name and information about the tribes of Whangarei. Te Tangata Whenua – the people of the land, descended from their ancestors who migrated from the Pacific. The entire walkway is accessible for walking, jogging and pushbikes. In addition, all sorts of mobility aids and scooters, and is furthermore suitable for pushchairs. Dogs on leads are welcome. Pushbike and E-bike rentals available at the local “Loop de Loop” which is located by the large playground. Whangarei Art Museum, home to the city’s art collection that embraces both heritage and contemporary works. In addition, it offers a captivating insight into the District’s history. Entry through “The Hub” information centre. The A H Reed Memorial Park is a magnificent remnant of the original Northland kauri forest. You can easily view maturing kauri trees known to be at least 500 years old. A raised walkway through the forest canopy allows for easy walking. The bubbling Wai Koromiko Stream runs through the middle of the park. Furthermore, the Paranui Falls, at over 23 metres high, is well worth a visit. This park is very close to Whangarei but you are completely surrounded by forest. Whangarei Quarry Gardens is a community garden project created by volunteers in the forested western hills of Whangarei City. Northland’s wonderful subtropical climate mixed with the sheltered and heat-radiating properties of a stone quarry is an ideal botanical microclimate. It offers a haven for growing a plethora of native and exotic subtropical plants. In addition to the beautiful gardens, you will find Quail Cafe nestled amongst the greenery. A great spot to re-fuel and relax. The Whangarei Quarry Gardens are located off Russell Rd in Kensington. Between 4500 to 6000 shoppers flock to the local growers market every Saturday morning. It is held at the Forum North carpark in the centre of town. This market was the first of its kind in New Zealand and is now the largest. Over 100 growers and stall holders selling produce they have grown themselves. Seems like the place to be on a Saturday morning! Enjoy the vibrant atmosphere. Enjoy excellent coffee while being entertained by buskers and taking the opportunity to chat with growers. It has become a ‘true heart of the community’ event for Whangarei families. Where: Water St, Whangarei When: 6:30 am – 10 am every Saturday year round. We recommend being there no later than 8 am. Mount Parihaka is an old eroded bush clad volcanic cone. Is almost visible and recognisable from probably anywhere in the city. Early European settlers contributed 143.5 ha to the bush reserve hence now home to a variety of bush walks. The summit is a popular destination for it’s panoramic views over the city and the harbour. The viewing platform is opposite a memorial to commemorate those lost in the two world wars. The Mountain Bike Club maintains a network of mountain bike trails on Parihaka. Visit the nocturnal Kiwi House & see the resident kiwi foraging for food as they would in the wild. Learn about Kiwi conservation, spot our native gecko and tuatara. A family-friendly environment with something for all. The Whangarei Museum is home to nationally significant Taonga (Maori treasure), early settler displays and ever-changing exhibitions. Adventure Forest offers high thrill activities packed with fun! Set your pace for an amazing journey through the tree-tops along high wire circuits packed with thrill and action. There are circuits for all ages and abilities. Countless wire traverses, tightropes and exciting swings. Furthermore, there are treacherous nets, wobbly bridges and of course lots of flying foxes. Bring your friends or family and share a great adventure. Explore the edge of your comfort zone, build up confidence and challenge your balance! Great family fun! The Abbey Caves Reserve comprises of naturally sculptured limestone outcrops, bluffs, enclosed depressions and sinkholes. There are three significant caves, Organ, Middle and Ivy. The Abbey Caves are undeveloped and unguided. Enter at your own risk and bring a good torch, sturdy shoes and a helmet. The climb down at the mouth of the caves should be the most difficult part of the journey. It is mostly firm level footing in ankle to thigh deep water. All of the caves have thousands of glow worms. A visit to this Reserve is well worthwhile and will leave you in wonderment. There are plenty of places to picnic or just lie back and enjoy the sound and scent of nature.